Getting your Texas driver's license doesn't have to be hard. Use Test-Guide.com's free Texas practice permit tests to prepare for your exam the fast and easy way. Our questions come right from the source - the Texas DPS driver's handbook. Our free TX practice exams don't require any registration or sign-up...and give you a score report with detailed explanations. How Do I Get a Texas Driver License? How Old Do I Have to Be to Get a Texas Driver License? What are the Needed Documents and Information for Application? What Tests are Required to Obtain a Texas Driver License? What are the Driving Restrictions for an Instruction Permit? How Many Questions Are On the Texas Driving Tests? What Is the Passing Grade for the Texas Driving Tests? What Happens if I Fail the Texas Driving Tests? How Should I Study for the Texas Driving Tests? How Much Does it Cost to take the Texas Driving Tests? What are the Requirements to Get a Texas Instruction Permit? Where Do I Take the Texas Driving Tests? Do I Need An Appointment? Q: How Do I Get a Texas Driver License? All applications for a Texas Driver License must be made in-person at a driver license office. You will need a completed application form (available at the offices or online), appropriate documentation of identity and residency, proof of registration and insurance (for applicants who own their own vehicles), and the appropriate fees. You will also be required to pass the knowledge (written), vision, and driving tests before a driver license will be issued. Q: How Old Do I Have to Be to Get a Texas Driver License? To obtain a full-fledged Texas driver license, you must be at least eighteen years of age. If you are under eighteen, you will need to work your way through Texas’ system of graduated, provisional licensing for minors. You may obtain your initial instruction permit at age 15, and can move up to a graduated license after at least six months with your permit. Q: What are the Needed Documents and Information for Application? In Texas, needed documents are broken down into three categories—primary identity documents, secondary identity documents, and supporting identity documents. To apply for a driver license, you will need one item from the primary identity documents OR two items from the secondary identity documents OR one item from the secondary identity documents and two from the supporting identity documents. Primary identity documents include a U.S. passport, a certificate of citizenship or naturalization, a Texas ID card, or an American Indian card. Secondary identity documents include an original or certified copy of your birth certificate. Supporting identity documents include a W-2 or 1099 form, a social security card, school or military records, a marriage license or divorce decree, a voter registration card, immunization records, and selective service cards. Q: What Tests are Required to Obtain a Texas Driver License? Testing for a Texas driver license will include a knowledge (written) test, a vision test, and a driving test. You will have to pass both the knowledge and vision test before a driving test can be administered. If you have a driver license from another state, you will not be required to take the knowledge and driving tests—however, this does not include applicants under the age of 18. If you’re under the age of 25 you will be required to successfully complete an approved driver’s education course. There are several options for completing this requirement, including education through a public school, a driver training school, or through parent-taught driver’s education. For those under 18, driver’s education must include behind-the-wheel instruction and should be at least 32 hours long. Adult driver’s education requires only six hours and has no behind-the-wheel requirements. Q: What are the Driving Restrictions for an Instruction Permit? In most cases, you will need to have a valid instruction permit before you receive a full-fledged Texas driver license. With an instruction permit you will not be allowed to drive alone—you must have a driver 21 years of age with at least one year of driving experience in the vehicle with you at all times. Q: How Many Questions Are On the Texas Driving Tests? There are 30 questions on the Texas knowledge test. For the driving portion of your test there aren’t any questions per se; instead, this test utilizes a point system. Q: What Is the Passing Grade for the Texas Driving Tests? For the written knowledge test you must answer at least 70 percent of the questions correctly. For your driving test you must complete the exam with fewer than 30 points deducted from your final score. The driving test awards points based on four primary categories—control (your ability to make the vehicle do what you mean for it to do), observation (your ability to be aware of what’s going on around you), positioning (your ability to stay in the correct lane), and signaling (your ability to correctly use turn signals). Q: What Happens if I Fail the Texas Driving Tests? Your application fee entitles you to attempt the driving tests three times within a 90 day period. If you fail the test all three times or exceed your 90 day limit you will be required to pay another application fee before you can be tested again. Q: How Should I Study for the Texas Driving Tests? The best method for studying is to familiarize yourself with the Texas Driver’s Handbook, which is published by the Texas Department of Public Safety and is available from their website. 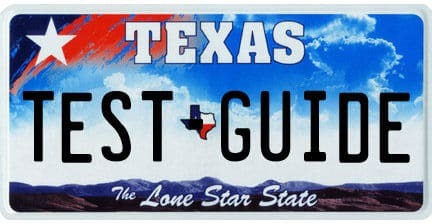 This guide contains important information about Texas driving laws as well as information about the format of the test. Once you have successfully completed the knowledge test, you can practice driving for the driving test under the supervision of a licensed driver. Enrolling in a driver’s education program is another great way to prepare even if you are not required to do so by law. Q: How Much Does it Cost to take the Texas Driving Tests? If you are applying for a Texas instruction permit, your fee will be $15. For those applying for the full-fledged Texas driver license (Class C) the fee is $24. As mentioned earlier, these fees will allow you three attempts to pass the test within a 90 day period. Q: What are the Requirements to Get a Texas Instruction Permit? To be eligible for a Texas instruction permit you must provide proof of high school graduation or GED equivalent. If you have not graduated high school, you must provide proof that you have been enrolled in school (public, private, or home) for at least the last 80 days or you must provide proof that you have been enrolled in a high school diploma equivalency program for at least the last 45 days. Q: Where Do I Take the Texas Driving Tests? Do I Need An Appointment? You can take your Texas driving tests at any Texas driver license office. You will need to schedule an appointment for the driving portion of your tests, which can be done online or in-person at a Texas driver license office.